Spirit of Freedom a custom built boat for divers, designed to make a diving safari in Australia comfortable. Spirit of Freedom ha 11 cabins for 26 passengers. Six double cabins located on the lower deck. This room has an additional single upper bed, so they can be booked for double occupancy or share with another diver. There is also a quad room suited for family vacations. All these cabins are en-suite, has air conditioning and plenty of storage facilities. Double stateroom also located on the lower deck. This cabin is slightly bigger and has a TV and DVD. Two types of cabins are on the upper deck standard and Deluxe. They feature with big portholes and gorgeous ocean view. All room has private bathrooms and individually controlled air conditioning, wardrobes for personal belongings. There are many places to spend time in between and after dives on a board of Spirit of Freedom. Boats dining area where meals are served can be used for working with laptops. It also has a flat screen TV. In the boats, salon passengers can drink tea or coffee, watch TV or use boats library. There is also a separate space for working with cameras. Boats bar offers to try some excellent Australian and New Zealand wines. beer and soft drinks. Spirit of Freedom has a big convenient dive deck with a diving platform. Here divers can prepare for the dive and store the gear. Dive deck equipped with two compressors and a nitrox membrane. Some equipment items can be rent on board. Safety is always in the first place for a team of Spirit of Freedom liveaboard. Boat has first aid kit, life rafts and life vests, fire fighting equipment. Boats crew trained to manage emergency situations. There are not many opportunities to meet such gorgeous creatures like whales. June and July passengers of Spirit of Freedom can meet minke whales near the great Barrier reef. Every year they migrating along the reef and sometimes whales’ nature brings them close to the boat where divers and snorkelers can enjoy observing them. Spirit of Freedom has been accredited as an Advanced Ecotourism Operator that means that boats crew pays special attention to reef conservations. Great Barrier Reef is a home for many fish and coral species, damage done to a reef can influent on world’s marine ecosystem. Spirit of Freedom liveaboard takes part in a Company which aims to reduce carbon emission and save Great Barrier Reef. Spirit of Freedom’ offers 3 and 4 nights itineraries. You can dive at Cod Hole and Ribbon Reef. These destinations can be considered as the most amazing and famous between divers. Giant potato cod is the main attraction of Cod Hole. They are friendly and divers brings them treats. It’s a home for sweetlips, triggerfish, scorpionfish and many others. Macro diving is great at Cod Hole and Ribbon Reef. Plenty of pygmy seahorses can be found in gorgonians. Diving at Great Barrier Reef possible all year round. Average water temperature ranges from between 22°C and 29°C. Best diving conditions are from September to November. My partner and me went on the 4 day Coral Sea and Ribbon Reef trip with the Spirit of Freedom at the end of September. The most amazing thing on this trip was the crew. They really worked around the clock to provide us with a fantastic experience. 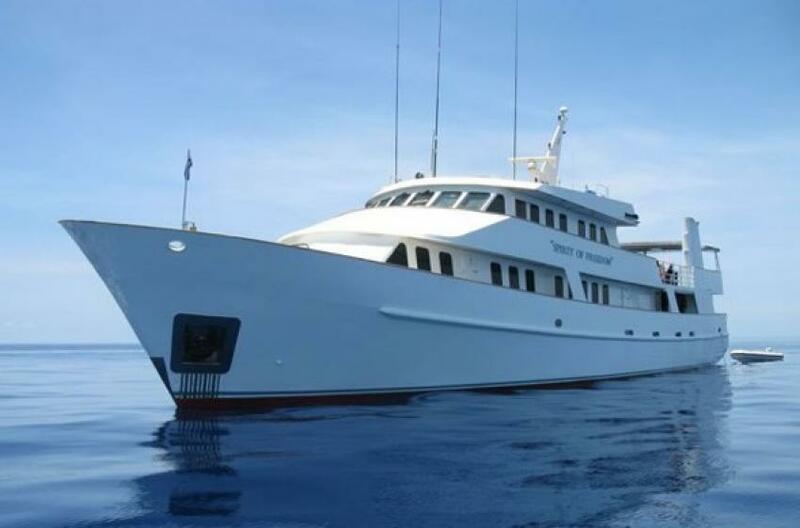 We chose this liveaboards because it is one of the only ones which visits osprey reef en the ribbon reefs, and you get all necessary information before hand (suvh as schedule, dive sites, etc). The boat has all necessary amenities, with a large dining room and sun deck, a tv room and comfortable cabins. The food was amazing and abundant. The deck dive was really spacious and the diving well organized. A lot of attention was given to safety procedures. Crew even puts you fins on before you are about to enter the water, what a service. A nice group of divers, all age rangers and levels represented (but you are grouped with those having similar experience). You can choose to follow a dive master or go on your own, and dive masters are switched around. Many positive experiences, only a few minor points. Take into account that the trip to osprey reef is long and bumpy, and its assumable that you will get sea sick, so do follow the instructions of the crew. It would be good when boarding to immediately check the presence of passengers their belongings. We got the intro talk first and were already sailing for at least half an hour when multiple people discovered their belongings were not brought on board by the crew. Some of us get a bit stressed by this. The boat did sail back to pick up our stuff, leaving us behind on schedule. We did get a compensation which was nice gesture, and I hope the crew has adapted their procedures following this event to prevent this in the future. They forgot to give us the engine room tour at the end of trip, sad to have missed that. We were somewhat disappointed by the diving it self (corals, animal life). I can imagine that when there in mink whale season this might provide the necessary thrills. But overall a really nice experience, and probably the best liveaboard if you want to visit this area.